(Arlington, Va) Long known for providing the most complete primetime coverage of the national political conventions, PBS NEWSHOUR is going to even greater lengths to give viewers a first-hand look at the 2012 party conventions. 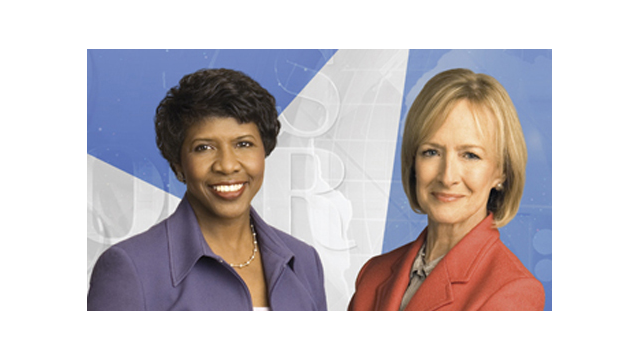 Award-winning political journalists Judy Woodruff and Gwen Ifill will co-anchor gavel-to-gavel broadcast coverage from the PBS Skybox at both the Republican National Convention in Tampa, FL (August 28 - 30) and from the Democratic National Convention in Charlotte, NC (September 4 - 5) as well as the Bank of America Stadium (September 6). NewsHour Correspondent Hari Sreenivasan will extend the coverage online via the NewsHour's interactive digital map center and "NewsHour All Hours" - a 24-hour livestream, powered by Ustream, Inc., on five different channels that offers viewers an "all-access pass" to the conventions. Shields & Brooks - Political analysis from NewsHour regulars, syndicated columnist Mark Shields and New York Times columnist David Brooks. Reports from the Convention Floor - Senior Correspondents Jeffrey Brown and Ray Suarez will have live dispatches from the convention floors throughout the evening broadcasts. Brown will be on site at the Republican convention in Tampa, FL and Suarez will be at the Democratic convention in Charlotte, NC. Political Analysis - NewsHour Political Editor Christina Bellantoni offers perspective and analysis on key developments at the conventions, with occasional appearances by Nathan Gonzales from the Rothenberg Political Report. Historians - Presidential historians Richard Norton Smith and Michael Beschloss will provide historical context of the candidates' acceptance speeches on the final night of each convention. By the Numbers - Andy Kohut, President of the Pew Research Center, explores data to provide insight on what motivates each party's activists and how voters identify with the parties; he'll drill down into the demographic shifts in the country that have changed the parties and voters' identification with them. Listen to Me - The PBS NewsHour showcases the voices of American voters through its year-long "Listen to Me" project asking their concerns and top issues driving them to the polls. The Daily Buzz - Political Editor Christina Bellantoni reports on how the politics of the conventions are being viewed online and what's buzzing on Twitter before the convention each day. Making Sen$e - Paul Solman examines the economies of Tampa and Charlotte. Spanish Language - PBS NewsHour convention broadcast coverage will include a livestream channel for Spanish speakers. Digital Map Center-- The Map Center shows electoral map data and other demographics. Using Mozilla Popcorn.js and open web tools, the Map Center will enable home viewers to follow along with the broadcast in real-time, on a tablet or other secondary device, and is fully embeddable. "The conventions have traditionally been PBS NewsHour's time to shine during the election season and this year is no exception," said Executive Producer Linda Winslow. "Viewers know we respect their intelligence and that when lawmakers and candidates approach the podium, we're going to step out of the way and let them see and hear the speeches for themselves. Between speeches, viewers count on our seasoned team of journalists, led by Judy Woodruff and Gwen Ifill, to home in on the issues and get explanations in interviews with party leaders, delegates and the candidates or their representatives." "PBS NewsHour's multi-platform approach will give the public the most up-close and engaging convention coverage available on air and online," said Paula Kerger, PBS President and CEO. "With news that is trusted, in-depth and independent, our PBS Election 2012 coverage will provide the latest election information whenever and wherever consumers want it." In presenting their 2011 award to PBS NewsHour, the judges for the Walter Cronkite Award for excellence in television political journalism praised Ifill and Woodruff for "focusing on the issues, talking with real voters and letting the candidates explain themselves." The NewsHour's emphasis on exploring issues in-depth and connecting with real voters extends to www.pbs.org/newshour , where the coverage continues around the clock via the "NewsHour All Hours" livestream. The Political Checklist - Each morning, Political Editor Christina Bellantoni will debrief co-anchors Judy Woodruff and Gwen Ifill about the nightly convention agenda as well as their take on political news and events. Noon Update - Each day at noon, Hari Sreenivasan will host a live update on convention events of the day, including official business, delegate meetings, activities outside the hall - such as demonstrations and protests. Behind-the-scenes-access- An area cam showing the convention floors, a workspace camera showing writers, politicians and booths, and a helmet-camera will provide viewers up close and personal viewers of the convention from all angles. Share Your Views- As part of NewsHour's partnership with Ustream, viewers can provide their perspective and engage in discussion while watching coverage online by sharing their views on Ustream's social streaming chat room. The Doubleheader - Mark Shields and David Brooks join Hari Sreenivasan for a daily online discussion about the sport of politics - and the politics of sport. Roaming Reporter - Hari Sreenivasan will roam the convention site, the delegation hotels and locales around Tampa and Charlotte seeking out and interviewing delegates, party leaders and voters. Breakfast Panel Discussion - Gwen Ifill and Judy Woodruff will host a panel discussion at each convention with the young leaders of the 21st century. Spanish translation - One of the livestream channels will extend the NewsHour's broadcast coverage to new audiences by providing simultaneous Spanish audio translation of all broadcast coverage. PBS NEWSHOUR is seen by over 5 million weekly viewers and is also available online, via public radio in select markets and via podcast. The program is produced in association with WETA Washington, D.C., and WNET in New York. Major funding for the PBS NEWSHOUR is provided by the Corporation for Public Broadcasting and public television viewers.